Nigel G. Mitchell - Author, Blogger, Geek: My Favorite Childhood Book: "The Hitchhiker's Guide to the Galaxy"
My Favorite Childhood Book: "The Hitchhiker's Guide to the Galaxy"
I read a lot of books growing up, but I have to say my favorite childhood book was The Hitchhiker's Guide to the Galaxy. When I was a kid, the world Douglas Adams created was so real that I actually believed it was what outer space was like. I used to stand in my backyard at night and look up at the stars, and dream of a spaceship picking up and taking me off to Magrathea or Milliways. I even made an electronic thumb with some wire and a D-battery...or what I thought was an electronic thumb, but just a wire that turned really hot. I packed a bag, just in case, and I always knew where my towel was. 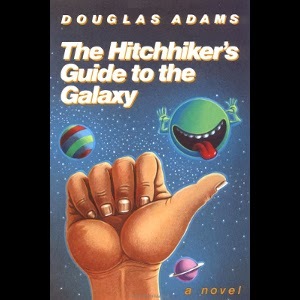 The very idea of creating worlds so rich and detailed, and writing books as funny as Douglas Adams was a large part of what led me to create my own novels. Do you love Douglas Adams? What was your favorite book as a child? I've read a couple of the Hitchhiker books. What did you think of the movie? I love the movie. Love everything about it. I think it was a matter of expectations. You wait twenty years for a movie and it can never live up to it. I didn't read that until I was an adult. I think my favorite one growing up was "The High King" by Lloyd Alexander. And yet I never try to write any fantasy stuff. Maybe I just don't think I can improve on perfection. A great series of books. Even the older ones, while not as good as the original are still 1000x funnier than most books today. I devoured anything by R.L. Stine when I was growing up. I didn't read Douglas Adams until high school. Everyone was gushing about him in high school. My favorite book as a kid was Maniac Magee by Jerry Spinelli, and it remains a treasured favorite.